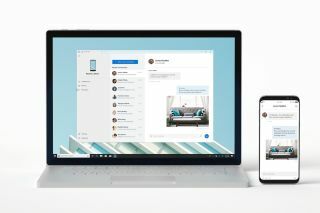 Microsoft appears to be going all-in on its ambition to make Windows 10 work with a huge variety of devices, even ones made by rivals, and it has even announced that it would be willing to work with Apple to bring iMessage support to its operating system. At its Build 2018 developer conference, Microsoft showed off its improved Your Phone app, which will let you read and compose text messages sent to your smartphone from within Windows 10, so you don’t even have to take your phone out of your pocket. Because of the way Apple’s iMessages work, Microsoft would need to work with the company to officially support iPhones in the same way that they are able to do so with Android devices. However, Apple is well known for keeping its ecosystem closed, as it would prefer that people bought a Mac to go with their iPhone, rather than a Windows PC. Microsoft has yet to approach Apple about it, but we’d love to see these old rivals work together more to bring better experiences to all their customers, no matter what hardware they use. Let’s hope this olive branch is accepted.